It’s well-known that you shouldn’t drink when you’re pregnant, but what about when you’re breastfeeding? That’s a question many new parents have. After nine months of no alcohol, you might be desperate for a glass or three of wine when you’ve got your little one settled. The trouble is, what you eat and drink while you’re breastfeeding can be passed onto baby. So if you do drink alcohol, will this too be passed on through your milk? 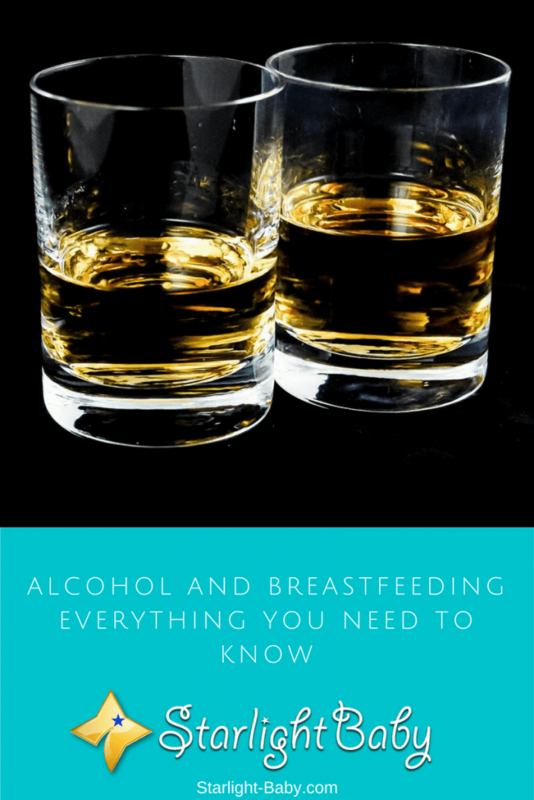 Here you’ll find out everything you need to know about drinking alcohol while breastfeeding. Keep in mind that this is purely a guide with information taken from numerous sources. Caution should always be taken when drinking and breastfeeding and we advise you to seek advice from a doctor beforehand. Is Alcohol Passed Onto The Baby While Breastfeeding? The short answer to this is yes. Any alcohol you do drink will be present in your breast milk. However, the amount of alcohol that is passed on will depend upon numerous factors. The time between drinking and breastfeeding for example, does make a difference. If you breastfeed your little one right before you have a drink, providing you don’t binge drink, there’s a good chance most of the alcohol will have been absorbed in time for the next feed. There will still be a little amount present, but not as much as there would be if you had a drink and then breastfed shortly after. It also helps to drink whilst enjoying a meal. That way, the food will soak up the alcohol, reducing its effects. How Long Should I Wait Before Starting To Drink Alcohol Again? The age of your baby will determine when you should start drinking alcohol again. While technically, it’s fine to enjoy the odd glass of wine or one unit of alcohol shortly after giving birth, it’s recommended you wait until your little one is a little older before starting drinking again. This is because younger babies need to be fed more frequently. You’ll typically be feeding sooner than every 2-3 hours, which means any alcohol you drink will still be very much fresh in your system. So in turn, more will be passed on to your little one than it would be if you were feeding less frequently when they’re slightly older. Here’s where it often gets confusing for women. Largely, the advice given is to “drink in moderation”. So what exactly does this mean? It’s easy to misinterpret as what some people class as moderate drinking, others class as too much or too little. Firstly, the type of alcohol you’re drinking will determine how much you can drink. Spirits are obviously a lot stronger than wine, so you’re not going to be able to drink as much if you don’t want it to affect your baby. So, the lower the alcohol content, the more you can drink in one sitting. However, it isn’t just the strength of the alcohol you need to consider. You also need to think about how quickly the alcohol enters and therefore leaves, the bloodstream. This depends upon both whether you’ve eaten whilst drinking and your body size. If you find you’ve drunk so much that you are sick, you shouldn’t breastfeed your little one until the following morning. In terms of how often you can drink, it’s recommended you do not go over 1-2 units per day. However, it’s much safer to go several days without any alcohol consumption. If I Pump Out My Breastmilk, Will That Eliminate The Alcohol? Some advice does state this could work. However, even if you do pump your breastmilk prior to breastfeeding after alcohol, it’s not going to eliminate it all. That’s because the alcohol is still in your bloodstream. If you are an average weight and you’re relatively healthy, it typically takes an hour for one unit of alcohol to exit your system. Despite popular belief, drinking a lot of water won’t flush the alcohol out any faster. What Happens If I Breastfeed Without Following These Guidelines? If you don’t follow the safe drinking guidelines and you regularly breastfeed after drinking heavily, how will this affect your little one? Well, it can have a major impact on baby’s development. Not only can it seriously harm your baby, but it can also reduce the amount of milk you produce. Overall, drinking very small amounts every now and again is unlikely to harm your little one when breastfeeding. However, you should always drink with caution and follow the above advice as a rough guideline. To be safe, consult your doctor to seek their advice on safe alcohol consumption taking into account your personal circumstances. If you’re taking antibiotics for example, that can slow down the speed in which alcohol leaves the blood supply. In the end, it’s much better to be safe than sorry. The guidelines provided here on how to go about taking alcohol while still breastfeeding is quite good but in my humble opinion, I wouldn’t advice it’s consumption at all for the period of time one is still a breastfeeding nursing mother simply for the sake of the baby. In as much as one is tempted to take a few alcohol once in awhile, I strongly advice mastering of self control and resist the urge for the benefit of the baby. I knew alcohol was bad for the pregnant woman and nursing mother even before my wife was pregnant.However, I did not know the exact reasons. But then when my wife became pregnant, I read a lot of articles and discovered that alcohol will pass into the fetus if the pregnant woman takes alcohol and it will pass to the baby from nursing mother.